If you’ve been following any style trends this fall, you’ve probably noticed a lot of suede. 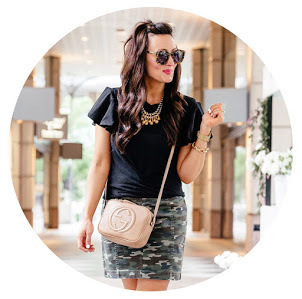 Suede moto jackets, suede vests and the super popular trend of the suede skirt. It’s actually been one of my favorite looks so far this fall because you can wear it so many different ways. Still hot outside? Wear it with a tank/swing tee and booties. Cold but not too cold? Wear it with a turtleneck or light weight sweater (my current go-to light weight sweater right now is this one here). Cold cold? Wear it with tights, a turtleneck sweater and a cute blanket scarf. So much versatility with just one piece of clothing, so much so that I’ve actually decided to add this piece into my staple wardrobe. A classic suede pencil skirt. Such a good idea. The faux-suede seamed skirt I’m wearing in this post is so comfortable, not too short, easy to move around in and matches with everything. This camel color is only available in limited sizes as of now, but it comes in a gorgeous navy color as well. (Which I just ordered because it’s on sale. Don’t judge.) I’ve also found some very similar styles here, here, here and here. If you aren’t crazy about the suede but want a neutral camel color skirt to wear all season long, this one here is similar and this one here is a perfect find as well. p.s. If you’re reading this post and thinking, “I’m not a skirt girl”, I challenge you to at least try it out. I have a hunch you might just love it.